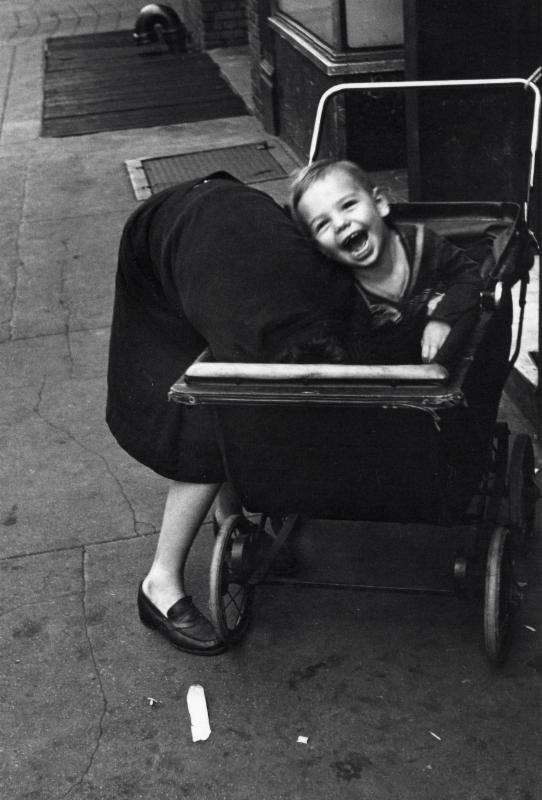 Laurence Miller Gallery now has on exhibit one the best yet underappreciated to capture the NYC streets, Helen Levitt. Laurence Miller Gallery presents HELEN LEVITT: PAIRS AND APPLES from June 14 – July 21. The show highlights Levitt’s unique gift for capturing the way people communicate through body language, with special emphasis on one of her perennial interests: pairs of people sharing a moment in the streets and on the stoops of her native New York City. Helen had a singularly lyrical eye and, whether it’s two children dancing in the street or two nuns perched at the bank of the East River, her work never fails to show the playfulness that is at the heart of human interaction. Not surprisingly, Helen reveals this in animals as well, joyfully sharing two New Hampshire pigs in a barnyard kiss, from 1986. This 30 print show surveys these themes across her six decade career, featuring both her classic black and white work which began in the late 1930’s, as well as her pioneering color work from 1959 on through the 1980’s. Among the works selected are a number of unique first prints, including two 4×5” contact prints of a gypsy boy at home, shot in 1939 using her friend Walker Evans’ camera and flash. The slight turn of the boy’s hand was the key to Helen’s choice to publish this one over the variant. Now open, Pairs and Apples will be on display until July 21st.